Prominent & Leading Manufacturer from Jaipur, we offer non woven bag making machine. Manufactures D-Cut, U-cut, Bottom gazette and side gazette bags of all sizes. Speed of this machine is to produce 50-60 bag per minute depending upon the fabric gsm. 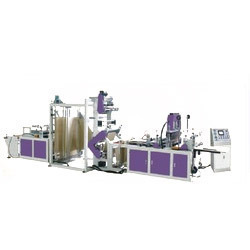 All range of fabric in terms of gsm and thickness can be made on this machine.